I’m kind of obsessed with stuffing things. Dessert things like cheesecake-stuffed strawberries, peanut butter-stuffed cookies and marshmallow-stuffed cookies. Aw, stuff it. It just feels good to say that, doesn’t it? As good as it feels to say it, it’s ten times better to eat it. I’m a sucker for peanut butter and chocolate, but when you stuff one inside the other and then smother it in warm chocolate glaze it’s kind of orgasmic. 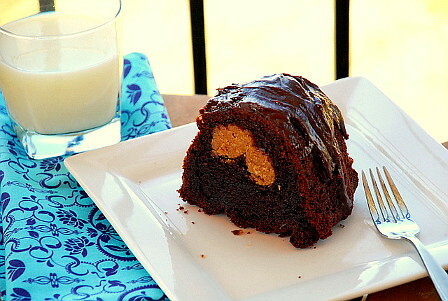 It’s a peanut butter cup in cake form…and I’m sorry to say I was rendered helpless in its presence. It disappeared in one day. Make this. That is all. Feel free to use your personal favorite chocolate cake for this. For the time and money, you can't beat my favorite -- it starts with a mix, but you'd never know it. Preheat oven to 350. Spray a 12-cup bundt pan with cooking spray. In a large mixing bowl, beat peanut butter, cream cheese and butter until combined. Add egg yolks, one at a time, and beat until combined. Mix in vanilla. Be sure to scrape down the sides. Pour in sugar and flour, mix until combined. Scrape mixture into a gallon-sized resealable plastic bag. Store in the refrigerator until ready to use. In a large bowl, mix together the cake and pudding mixes, sour cream, oil, beaten eggs and water. 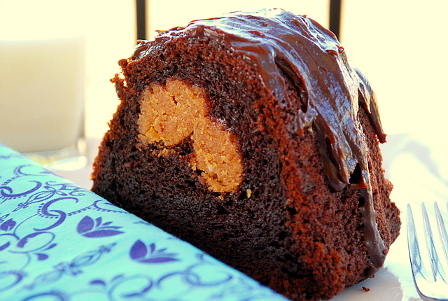 Stir in the chocolate chips and pour 1/2 of batter into bundt pan. Cut a corner off the bottom of resealable bag with PB filling. Pipe filling evenly over cake batter. Spread remaining cake batter on top of peanut butter filling. Bake at 350 for 50 to 55 minutes, or until top is springy to the touch and a wooden toothpick inserted comes out clean. Cool cake thoroughly in pan before inverting onto a plate. In a microwave safe dish, melt chocolate chips, butter, and corn syrup in 30 second intervals, stirring after each. When melted and smooth, add vanilla. Spread warm glaze over top of cake, letting it drizzle down the sides.